Astrology is the mystical art of using the language of heavens- the symbols and patterns of stars and planets- to understand our lives and to give it depth, spirituality and guidance. Many ancient cultures and civilisations have had astrology as an integral part of their religions. Old kings and Emperors have been known to have employed a Court Astrologer to advise them on matters of State, Wars, marriages and disasters. The old and derelict temples of Egypt, Mayas & Incas, Indus Valley (Hinduism) are full of astrological imagery. Ordinary people still consult their birth charts and family astrologers before planning major events in their lives (getting married, starting a new business, buying a house etc). Empirical nature: In many ways Astrology is partly an empirical science – very much like chemistry- where a huge amount of observations create a set of `rules’. Chemistry evolved empirically, before molecular and atomic theories explained the deeper processes. Likewise, Astrologers for many thousands of years have and continue to observe stellar phenomena (what stars and planets are doing) and compare those stellar events in conjunction with human and worldly events- major trends, developments, advances, scientific discoveries, politics and catastrophes. 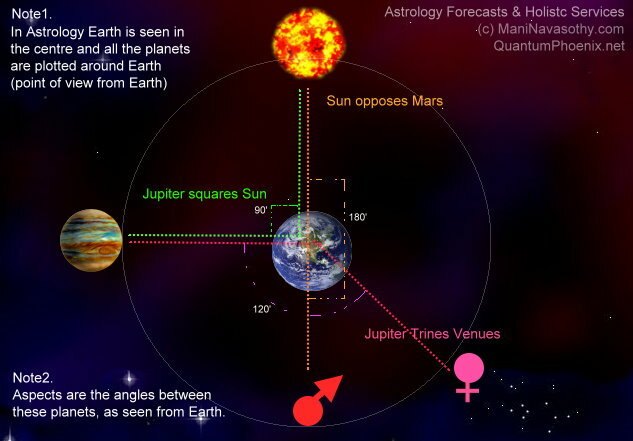 Out of these real observations, empirical connections are made, and astrological principles and rules are arrived at- and continually developed. It must be emphasised that astrology is a living art – and each person who practises or explores it is adding to it and changing it. The cumulative benefits of these will only be apparent as decades if not hundreds of years pass – for astrology deals with the vast time scales of planet and stars! Astrology was the precursor to astronomy, and so there are those people who believe astrology should be consigned to the history books (no that we have astronomy). But as said earlier, astrology continues to evolve, and coupled with mysticisms, it continues to provide depth and fulfilling spiritual needs in millions of people’s lives, even today! On `aspects’ and points of reference: An astrological aspect is when two or more planets form an `apparent’ connection to one another. It must be born in mind that aspects can not exist on their own, without a point of reference or observation. For example, if 10 people were walking on a large ground, at any one time, some will be in a line- only if we look from a particular point of view. Some may be walking at different speeds, and at certain points, pass along another person. So in astrology, the point of reference is `us’ – the people on planet Earth. Although we all know that the Earth and all the planets revolve in orbits around the Sun, looking at the heavens from Earth makes it `seem’ that everything is revolving around our own planet Earth. An understanding of geometry and astronomy always enhances the practise of astrology. Energy of Aspects: A conjunction is when 2 or more stellar objects (planets) seem to line-up closer to one another. They may be millions of miles apart, but happen to be located within our line of sight. Their `energies’ or influences add up. This can be highly positive (e.g. an artist and a poet meeting up!) or disruptive (imagine 2 bullies meeting up!). As said before, thousands of years of observation indicates that when planets `form’ certain aspects, their influences affect us in different ways. Ephemeris – what does it show? An ephemeris is a book of tables! It gives planetary data- positions of planets for every day of the year, and also what aspects planets are forming. Data on Sun rise and sunset times for different parts of the world are also included, as well as when an eclipses, full moons & new moons occur. 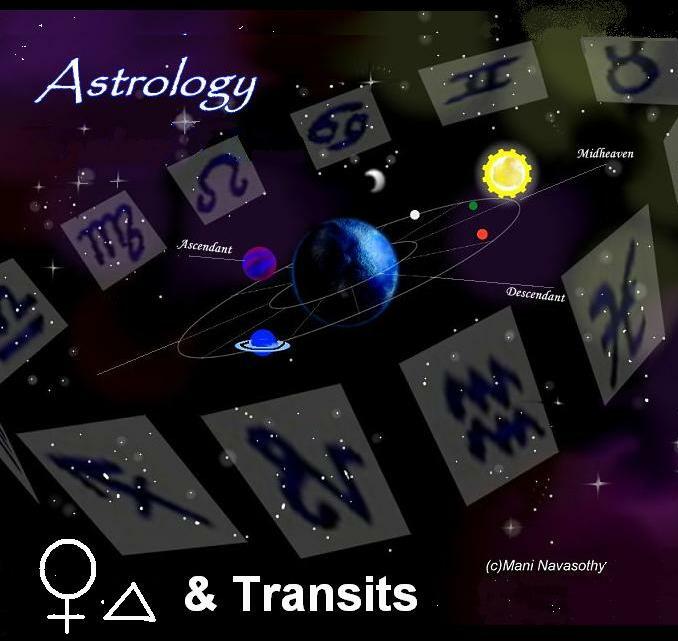 Another important list of data is the transits of planets- that is when a planet enters and leaves a particular zodiac (star sign!). Here are examples of an Ephemeris– with annotations on how to interpret the data. By studying the examples being pointed out, you can easily begin to work out how to use an ephemeris more effectively. We’ll have more tips and tools in our next issue. ~ Mani Navasothy. 29th June’11.. 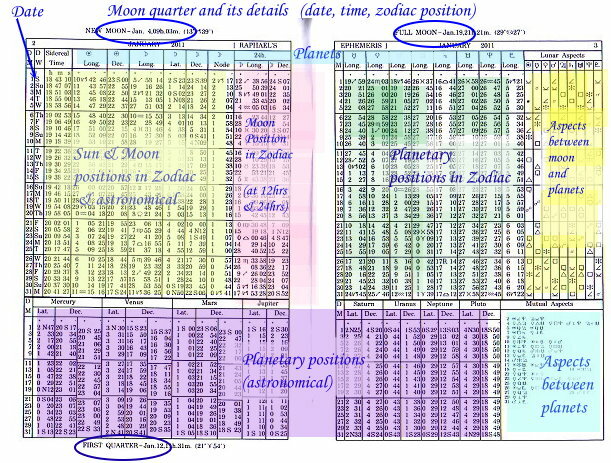 This picture shows the main pages of an Ephemeris, where positions & data can be found for Moon phases, Planetary positions, and aspects between planets. This is a feature piece originally written for the first issue of Gaian Times e-magazine (June 2011).